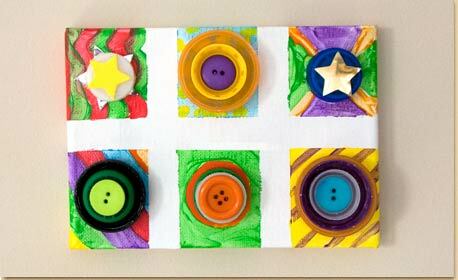 Collect and re-use plastic bottle caps to make a vibrant wall collage. Use the masking tape to divide your canvas into approximately 2” square sections. 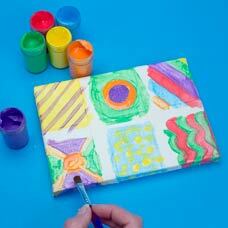 Paint different bright colored designs in each of the squares. Make sure to paint the edges of the canvas too, let dry. Once the paint has dried gently remove the masking tape, you will have nice clean edges between the different designs. 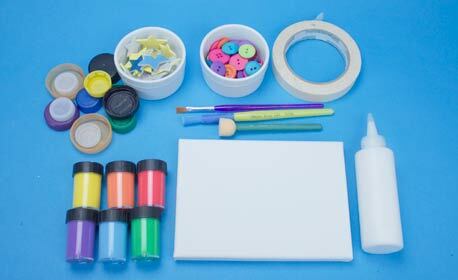 Begin decorating the canvas with dimensional objects. Glue colorful plastic bottle caps upside down onto the squares. Play around with layering! Lay smaller bottle caps inside larger ones, or even use materials like buttons inside this shape. 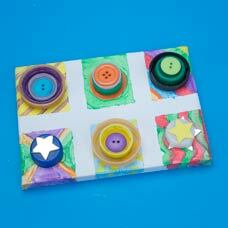 Finish your collage with stacked bottle caps and dimensional elements or decorative pieces, like stickers!